Anup Rau, 40 CEO, Reliance Life Insurance's vision is to make Reliance Life the most admired insurance company in India. Many decisions of this Delhi boy have been instinctive and intuitive. After graduating in Economics from Delhi University, Anup Rau, who now heads the Reliance Life Insurance, joined Gilson Medical Equipment, a French company, in Delhi as a sales engineer. What attracted him to the job was the promoter's promise to give him a ticket to Paris for training if he would work for a year. "The promoter kept his promise," grins Rau. Next on his agenda was an MBA degree from Mumbai. "I wanted to be in (Mumbai) city," he says. On joining ICICI Prudential Life Insurance, Rau says: "I saw two huge waterfalls in front of the ICICI. I said to myself: Wow, I must work here." The decision to join ICICI Pru Life in 2000 was actually the big turning point in his life. It was a start-up in an all together new industry. For the first time, private sector companies were getting into the industry to compete with the Life Insurance Corporation of India (LIC), which had the monopoly all along. "Most new recruits came from outside the industry," says Rau, who joined ICICI Pru Life as a branch manager and worked across geographies in sales, planning and strategy. He stayed there for a decade. "In terms of culture and governance, ICICI Pru was far superior," says Rau. In 2010, he decided to make his next move in the insurance sector. "I got a larger responsibility in HDFC Standard Life Insurance," says Rau who was Head (Sales and Distribution). That stint lasted two-and-a-half years. "It's a solid company because of its conservatism," says Rau. Last year, he reached the corner room of Reliance Life Insurance. "It's an open organisation and less hierarchical." As CEO of Reliance Life Insurance, the Anil Ambani-owned life insurance venture, Rau's focus is on ensuring a sustainable and profitable growth. The industry is already experiencing pain due to slowdown and regulatory intervention. "My vision is to make Reliance Life the most admired insurance company in India," says Rau, who is currently busy working with the Japanese joint venture partner Nippon Life. "Nippon has got infinite patience. It is fanatical about detailing and accuracy," he says. FULL COVERAGE:Business Today's India's hottest executives under 40 listThe current slowdown in the economy is a blessing, according to Rau. "In these circumstances, you can truly differentiate yourself from your competitors," he says. His focus is on delivery and execution mechanism. Today, Reliance Life doesn't have the advantage that other players have, in terms of having a bank in the group. Reliance Life's business mix today includes traditional products (80 per cent) and ULIPs or unit linked insurance plans (20 per cent). There was a time this mix was completely opposite in the industry. "The ULIP customers should have longer term horizon to stay in a scheme," says Rau. The returns in ULIPs are linked to stock market performance and hence they are risky because of volatility in the share prices. And that is the big challenge because ULIP customers generally have a short term view of three to five years. In terms of business, Reliance Life clocked a business premium of Rs 4,015 crore in 2012/13. Its assets under management are about Rs 18,189 crore. Today. Reliance Life in among India's top five private life insurers. Rau says he doesn't need any fresh capital. "I don't see the need for capital in the next three to five years." Like his career, Rau's interest and hobbies have also changed overtime. He used to play cricket when he was younger. Later, he tried his hand at golf, but gave it up. 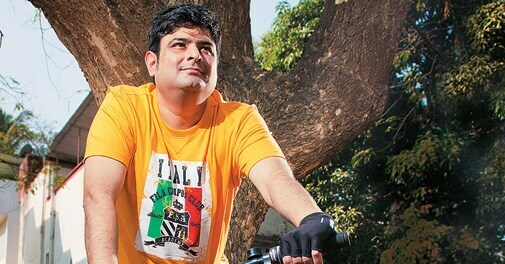 "Now, I take my two daughters for cycling," says Rau. His focus mantra: to break down the deliverables into small parts.